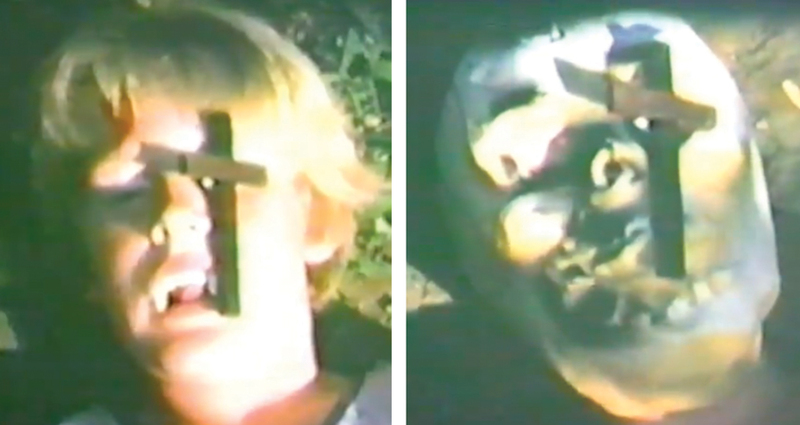 My little brother plays a vampire who, vanquished by a crucifix, becomes a skeleton in my Super 8 film “Fury of the Vampires” (1971). This amazing effect was achieved via “stop motion” photography (that’s a technical term) and a rubber skull mask. It’s no surprise that drunken costumed guests at Halloween parties can become brazen flirts … or that terminally shy kids turn into extroverts once they don the giant head of the team mascot. Something changes when you put a mask on. Just ask Bruce Wayne or Peter Parker. 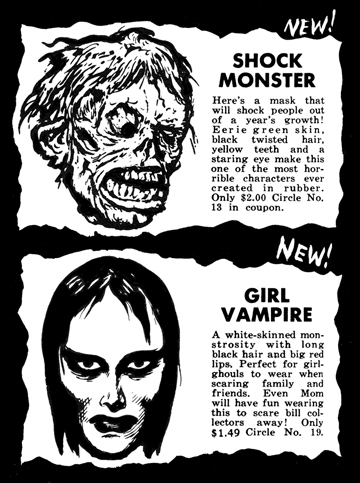 Masks were a huge thing during the Monster Craze. I pined away for the Don Post Studios masks, which cost a fortune in 1960s kid money, but were fascinating replicas of movie monsters. 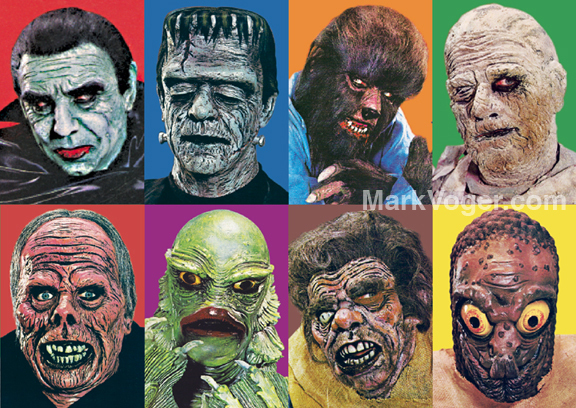 I’d seen the ads in Famous Monsters for years, but I’ll never forget the first time I saw them “in person.” It was at the Movieland Wax Museum in Los Angeles in 1972, the summer after I graduated eighth grade. The masks, all of them, were in Movieland’s gift shop (on high shelves, so as not to be molested by the lollipop-sticky fingers of tourists’ little brats). It was a revelation to see them for real. I later owned two of Don Post’s Tor Johnson masks (one was stolen, the other is in pretty bad shape), but never one from that “first string” of monsters. If you loved monsters; watched the movies; studied the magazines; painted and glued the model kits; how could you take your fandom to the next level? This was possible thanks to manufacturers — chiefly Don Post Studios and the Topstone Rubber Toys Company — who found a niche making monsters out of young monster fans. Prices varied wildly, especially in 1960s money. Connecticut-based Topstone’s monster masks, some of which predated the Monster Craze, were sold in stores and via mail order (including Warren Publishing’s ever-enterprising merchandising arm, Captain Company). 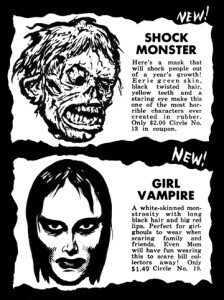 Topstone’s masks of more or less generic monsters (Girl Vampire, Lagoon Monster, Horrible Melting Man) sold for an eminently affordable $1.49 each. But quality doesn’t come cheap. 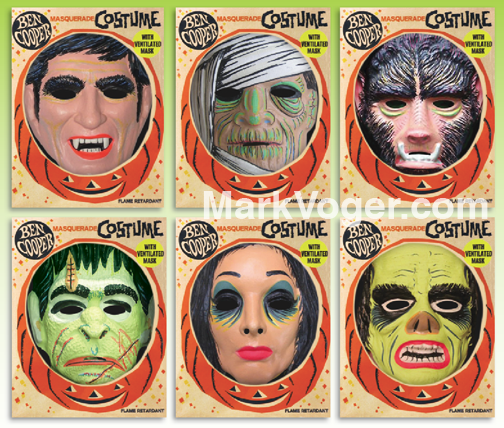 Don Post’s masks were dead-on likenesses of movie monsters such as Dracula, Frankenstein, the Wolf Man, the Mummy, the Phantom, the Creature, the Hunchback and Mr. Hyde. Post went off-road with masks of the Metaluna Mutant from “This Island Earth” and — though one can scarcely imagine the demand — the Mole People, eh, Person. Famous Monsters publisher James Warren made a deal with Langdon to market the Don Post masks. Langdon (1941-2011) was a vital, versatile behind-the-scenes player during the Monster Craze. In addition to his work with Don Post Studios, he co-produced (with Milt Larsen) Boris Karloff’s album for Decca Records, “An Evening With Boris Karloff and His Friends.” It was Langdon who came up with the idea to market a Tor Johnson mask. In Famous Monsters #39 (1966), Langdon wrote that “Planet of the Apes” makeup wizard John Chambers, then second vice president at Don Post Studios, helped create the Tor mask, which indeed took on a life of its own. (Mel Gibson goofs around with one in 1979’s “Mad Max”). If you didn’t have 34 bucks, maybe you could scrape together a lousy $8.95. There was always Ben Cooper, Collegeville and Halco, manufacturers of super-chintzy — and, admit it, cool in their way — Halloween getups that often didn’t make it through the Big Night. The “costumes” were glorified aprons (in “rayon taffeta”) … the crackly vinyl “masks” were affixed with a rubber band … crossing the street while trick-or-treating was a life-and-death proposition … every kid stuck their tongue through the mask’s super-tiny “mouth,” despite the likelihood of factory germs.